Don’t expect Jenn Patterson to be overwhelmed Saturday when she sends out her first horse of the year, first in a stakes and just the 18th in a fledgling training career -- also in one of the marquee races on the richest day of Laurel Park’s winter season. 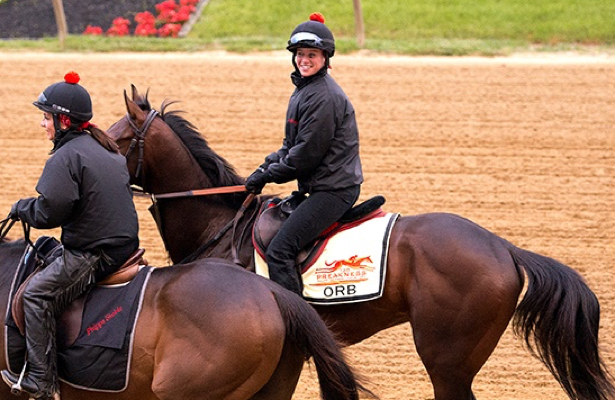 As a former assistant to Hall of Fame trainer Shug McGaughey and the exercise rider and travel partner for 2013 Kentucky Derby winner Orb during his Triple Crown run, which included a stop at legendary Pimlico Race Course for the Preakness Stakes, the 38-year-old Patterson is no stranger to being on the big stage. A native of Wilmington, Del., Patterson finds herself back in Maryland with Harry Rosenblum and Robert LaPenta’s Grade 3-placed stakes winner Uncontested for the 43rd running of the Grade 3, $250,000 General George. The General George for 4-year-olds and up and the $250,000 Barbara Fritchie (G3) for fillies and mares 4 and older, both at seven furlongs, co-headline a Winter Carnival program featuring five stakes worth $800,000 in purses. It will be the second start for Uncontested since joining Patterson’s modest seven-horse string at Keeneland-owned The Thoroughbred Center in Lexington, Ky. last fall. “To be able to not only get to the Derby but win, not a lot of people get to say that so that was a lot of fun,” Patterson said. “The horse was just doing so well. To be able to work with the Phipps and the Janneys and Shug and everybody, you can’t help but learn a lot from all that. Orb ran in all three Triple Crown races, finishing fourth in the Preakness and third in the Belmont Stakes, and recuperated that summer with a string of McGaughey’s horses at the Fair Hill Training Center in Elkton, Md. The connections would eventually purchase a barn on the grounds and stable 28 horses, with Patterson at the helm. Growing up in the steeplechase world, Patterson worked and rode for several trainers including her parents. Her father, Duncan, who has a long history in steeplechase and flat racing that includes time as a trainer, rider and executive, had her galloping horses at the age of 10. A graduate of Gettysburg College in Pennsylvania with a degree in business management, Patterson began the transition to Thoroughbreds when she got a job with Eoin Harty in 2005. Less than a year later, when Harty shipped his horses back to California, Patterson hooked on with McGaughey at Saratoga, working her way up the ladder during an eight-year stay. Patterson gained national recognition for her work with Orb, who won the Fountain of Youth (G2) and Florida Derby (G1) at Gulfstream Park prior to his victory in Kentucky, a popular triumph for the well-liked and highly regarded Lexington native McGaughey. Among other top horses she regularly galloped were Point of Entry, a five-time Grade 1 winner of nearly $3 million in purses from 2011-13, and Imagining, a multiple graded-stakes winner of more than $1.77 million including the 2014 Man o’ War (G1). Patterson got a taste of what it was like to run her own shedrow during the time at Fair Hill, frequently bringing the McGaughey horses back to the races at Laurel. She took out her trainer’s license in December 2017 and hung up her shingle last April in Kentucky. Rosenblum-owned Sports Story was both Patterson’s first official starter May 17, 2018 at Churchill Downs, and first career winner, coming July 19, 2018 at Belterra Park in Cincinnati. Prominent national owner Michael Dubb has also been a primary supporter and client from the beginning. Uncontested won the 2017 Smarty Jones Stakes in his third career start and first as a 3-year-old, putting him on Oaklawn Park’s road to the Triple Crown. After finishing off the board in the Southwest (G3) and Rebel (G2), he ran third in the Pat Day Mile (G3) on the Derby undercard. The 5-year-old son of Tiz Wonderful won one of his next six starts into last March for trainer Wayne Catalano before going to the sidelines. He was initially sent to Hall of Fame trainer Steve Asmussen to begin his comeback, ultimately landing with Patterson when the owners sought a smaller outfit. “He got to me in the beginning of November and he had a lot of weight on him, he was moving great. They did a really, really good job with him,” she said. “We found when there was more spacing between his races and his works, that’s when he seemed to be at his healthiest and would run his best. Uncontested made his debut for Patterson with a front-running five-length romp under Trevor McCarthy in a six-furlong optional claiming allowance Dec. 23 at Laurel, a field that included Grade 3 winner Just Call Kenny, multiple stakes winner Do Share and Grade 3-placed Sheikh of Shiekhs. When it came time to decide where to go next, it didn’t take long for the owners, Patterson and her boyfriend, assistant and Uncontested’s exercise rider, Tyler Pizarro, to settle on the General George as his 2019 launching point. The General George will mark the return to stakes competition for Uncontested. In his last attempt, he was beaten 2 ½ lengths while sixth behind Whitmore in the six-furlong Phoenix (G2) in October 2017 at Keeneland.